Mythmoot IV will be held from June 1 – 4, 2017 at the National Conference Center in Leesburg, VA. Join us for learning and fun! View proceedings from this past event in the Signum Library Digital Collection. See details about upcoming Mythmoot conferences on our Mythmoot page. Mythmoot IV will be held from Thursday, June 1 through Sunday, June 4, 2017, at the National Conference Center in Leesburg, VA. Note that this conference will be one day longer than previous Mythmoots! It will also include the traditional banquet on Saturday evening, with much food and merriment for all! 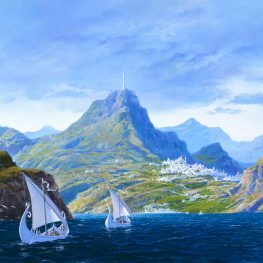 “The White Ships of Valinor” used with permission from Ted Nasmith.